Happy Holi 2019! Gulaal (colours), the pichkaris and the water balloons are out as people in India gears up to celebrate Holi. The festival of Holi is being celebrated on March 21 this year. While Holika Dahan will take place on March 20, Dhulandi will be played on March 21. If you're looking forward to hosting the perfect Holi party, it's time you get your playlist ready. The festival of Holi has indeed been among favourites when it comes to Bollywood films. 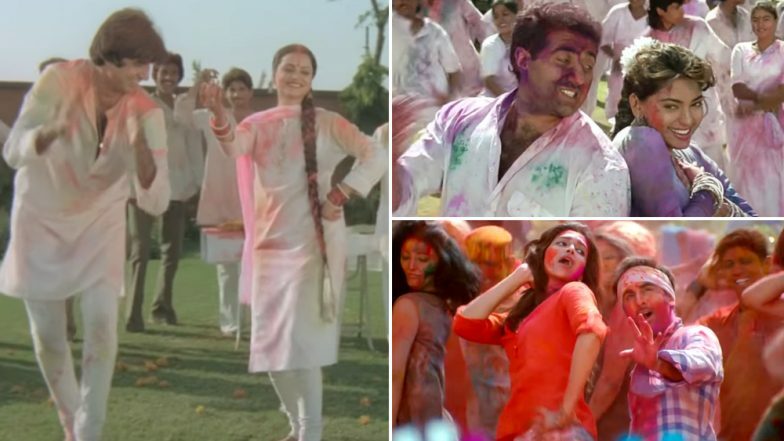 Thanks to this fondness for the colours, Bollywood has given us some of the best old and new Holi songs over the years. Holi Marathi Songs 2019: Ala Holicha San Lai Bhaari, Kheltana Rang Bai and Other Numbers That Will Make this Festival of Colours Musical! (Watch Videos). From grooving to Balam Pichkari to flirting around with Ang se Ang and tiptoeing to Let's Play Holi, Bollywood is full of some great feet tapping numbers for the festival of colours. Even as new Holi songs continue to be added to the list, some of the melodies like Rang Barse and Holi Ke Din remain timeless. Travel Tip of The Week: Things to Keep in Mind If You Are Traveling to Celebrate Holi. Starring Amitabh Bachchan, Rekha, Jaya Bachchan and Sanjeev Kumar, Rang Barse from the 1981 Yash Chopra movie Silsila remains a Holi classic. It's been years to this song, yet people love crooning it around this time of the year. People, in fact, try to imitate the voice of Amitabh Bachchan when they sing the song. 'Do me a favour, let's play Holi', if you're not crooning that song in the typical Anu Malik style, you're doing it all wrong. Starring Priyanka Chopra and Akshay Kumar, this is one song that you can love or hate but cannot ignore since it plays at every single Holi party around. The song is from the 2005 movie Waqt. If there's one song that'll make every single person dance at your Holi party, it is Balam Pichkari. Starring Deepika Padukone, Ranbir Kapoor, Kalki Koechlin and Aditya Roy Kapoor, this song from Yeh Jawaani Hai Deewani is young, colourful, peppy, happy and everything that you want of a party number. The hook step of the song is something everyone remembers and does when the song plays at Holi parties. This song from the film Goliyon Ki Raasleela Ram Leela, starring Ranveer Singh and Deepika Padukone, this Holi song is steamy, sensuous and romantic. It has to be a part of your Holi playlist because it's more than just another dance number.